Why do I Love Dobes? I enjoy the combination of beauty and brains that a great Dobe has to offer, as well as the fact that these dogs can be social climbers, serious protectors, and best buddies. When selected correctly and provided with a proper education that includes the expectations of our society, this would mean a dog that is capable of kid-sitting, watching over the family (night and day) and fitting into the most intricate situations you can imagine provided their human counterpart has those equal capabilities. The right Dobe is capable of becoming not only a member of the family, but a true extension of its owner. The right Dobe is capable of becoming not only a member of the family, but a true extension of its owner,consideration for the dog's likes and dislikes, a life with the right Dobe is a phenomenal experience. Before I knew dogs came in different styles (breeds) , I learned to walk holding onto aDobe; and even though my situation evolved differently, than most, many of our clients today also began life holding onto a Hoytt Dobe's ears. If these dogs were anything less than spectacular, I'd probably have become the most famous Koki Producer in the world instead of the power behind today's Hoytt Dobe. Considering the number of shelters and rescue organizations at maximum capacity, it is clear that there are many impulsive buyers who decide to acquire a dog today, bring one home tomorrow, and the day after put it out back. Please don’t be “one of these buyers” who has failed to understand the responsibility of canine ownership, which is almost as complex as raising a child, from the need for personal attention, finding the right doctor who practices veterinary medicine more then creative accounting which comes down to the single biggest area not considered or at least given the consideration that your new canine's doctor is as important as deciding where you will acquire the kid. Genetic health history of the bloodline is even more important then the health at time of delivery but at least most sellers will take a dog back if on examination by your vet it is found to not be the most healthy creature. But further into life specially years into the relationship where health is a combination of your care and the lack of inherent problems - always remember a breeder who has not built their own lines can only pass on what has been learned during the years they have owned the mother - just remember Out Crossing is like a seven number lottery ticket, you only win by luck. Line breeding is being offered six of the winning numbers, your care represents that final number which makes you a winner. Should your next dog be a Hoytt, or the other guys? I can't help you there. I am a Doberman enthusiast, and a Dobe with all the right character traits creates tunnel vision. I want the best, and for me there is but one 'wine'. Hoytt ... Vintage 1945. If you have done your research and have long-term expectations then I suspect you already have the answer to whether or not House of Hoytt Is the Way to Go. Do you want a dog that you can take to one or more types of trials in obedience, rally, agility, or Schutzhund (VPG)? Do you have the time and energy necessary to devote to the training and ongoing refinement of your canine’s lessons and of course the funds? Train and handle the dog yourself and the costs can be kept to a few hundred a weekend. Have a top trainer/handler and you could be spending hundreds a day since you will also be picking up travel-related costs and trainers and kennels will not actually guarantee a successful showing just a guaranteed bill.. If you are thinking formal obedience or high performance competition...look to breeders that have really proven themselves not just a few times but hundreds of times. Why not go with the winner? Winning is so much more fun and intelligence is as genetically enhanced as comprehensive qualities and physical attributes. Again the more knowledge the seller has of both their dogs mind and body, the greater the chance of total owner satisfaction and the more correct instructions can be passed on throughout the dog's life, from behavior guidance to health matters. Consider the ultimate family tree...You meet a wonderful person who you think you want to spend the rest of your life with. Initially most of us work on first impressions; important, of course, but what if we could step into a time machine and meet not only the parents, but the grandparents, the great-grandparents and even the great-great-grandparents. Now, were those you met wonderful caring folks or a group of individuals with health issues, emotional problems and lack of drive? This is the advantage a creator of a Line of canines can have. Select the pair to be mated through past knowledge of the individual dogs behind the producing pair. 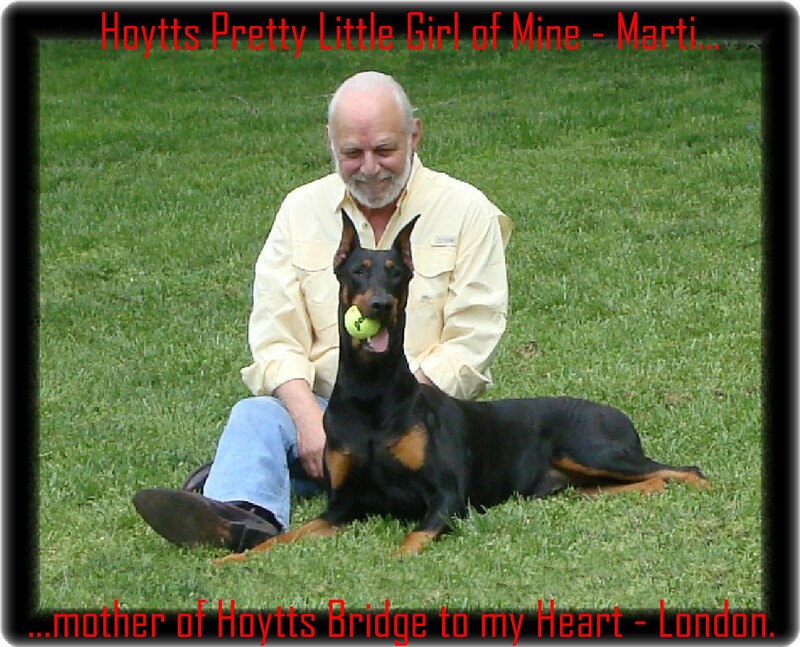 Marti - Formally Hoytt Pretty Little Girl of Mine CGC RN CD - She's all I could ask for in a great companion but I'll refrain from further bragging with the following comments. I expect as much 'wonderful' in my personal Dobes as I seek for those who have welcomed Hoytt Dobes into their heart. and my Mart was everything I could of asked for plus. Now my London continued to carry on her Line's qualities, actually Marti gave us Hoytts Turn the Paige and in turn I chose one of her girls to bring in the next generation . From Paige came my London formally Hoytts Bridge to my Heart. Now two of London's pups now adults who left us as Presidents Choice graduates will bring in the next generation. Maddi formally Hoytts Sweet Child of Mine CGC BN CD TDI and Sierra formally Hoytts Sierra Sky CGC RN CD will bring in the fourth generation continuing our tradition of blood line protection. In today's canine world we are the only Dobe breeder that creates unmatched odds of total success through first-hand profiling of at least the past five generations of 'family' to create the 'kid' you may soon be welcoming into your life. See Owners Gallery to learn about this Hoytt Dobe. TEMPERAMENT...Is a breeder's claimed success dependent on one or two personal dogs? Have they consistently showed off their youngest, freshest minds in the obedience ring? Has the breeder you are considering even attempted to work on the intellectual levels of their dogs? Remember, the obedience ring is how breeders can show off their various breeding stock personalities, comprehension skills and balanced temperaments. The obedience ring after all is for those 'creators' seeking to breed the best in companions...the performance ring is in fact the test track of the mind. Too many downplay the importance of education because they themselves may also be a bit short. Those folks cannot even imagine what it takes to create a really great companion. Education is not reliant upon the dog’s looks, it is an added touch; a sign that structural health was part of genetic considerations when mated. Of course we have added looks to our pup’s great minds. Beginning around 1958 we began creating the American Champions that began the Hoytt Line and by the late seventies had our elegance established. So well in fact that the Hoytt Dobe has graced more dog magazine covers than any other breeder's dogs to date. We began by catering to 'the look' buyers, today we cater to those who seek elegance, intelligence and personality...all in one package. And with our unmatched pre-placement educational programs, we stand alone. PROFESSIONAL SERVICE AT A PERSONAL LEVEL, offering our knowledge of a single breed from matching mates to medical services, from basic education to areas of specially-designed, individual client-needs training. Actually in the end, the only unknown will be you, and we will do our best to bring you into our family circle, no matter where you may reside, through discussions and our questions. On the other hand, if you are like most of our clients and just want "the best of the best", choose the programs you prefer and begin studying the advanced six-plus hour instructional video you receive from us while you await the arrival of your Hoytt Dobe. If you're looking for a bonus in your companion/traveling buddy, then look at getting a pup with an education from our advanced Super Pup programs to the Rally Degree or the ultimate pre-placement refinements of the Companion Dog training and title. The fact is that everything in AKC & UKC ring certifications up to the Companion Dog title work to enhance daily manners. A truly great Dobe comes equipped with a great mind, and these special Dobes need “a job.” The right Dobe likes to have jobs and will go all out to prove just how anxious they are to please you by showing what they know...what you asked them to do. So if you don't have to sell off your first-born, consider pre-placement education for your future best friend and guardian. QUESTION? Do you need obedience to have a great companion? Absolutely! However, ring obedience is simply a high performance version of daily needs, and most of our clients are very pleased with our primary Super Pup Programs; but, for many, high school was not the end of their education or their expectations, and these folks want these advantages for their new friend. QUESTION? Can you educate your new pup on your own? You bet, and we are here to answer any questions you may have, but you have to be very serious about this and have the ability to structure the early months of ownership so not to one day find your new kid was 3 months old on Monday and 7 months old on Tuesday. Forget the worry about bonding and age from day one, and for the life ahead every day is a bonding experience, but in the canine world education can't be delayed. Now, don't believe for a moment that an education will change the basic personality of a dog; if the dog simply does not have the personality you sought, all the training in the world will not change the God-given unwanted variables. Excellent instruction only allows altering to varied degrees. This is just one more reason we have gained client ongoing trust. And just two years ago we selected and trained a handsome young red boy for a client who was 99 years of age. And, yes, there were a few safeties. His maid was a young eighty years, and then there was the child. The youngest member of the family was just sixty-five. 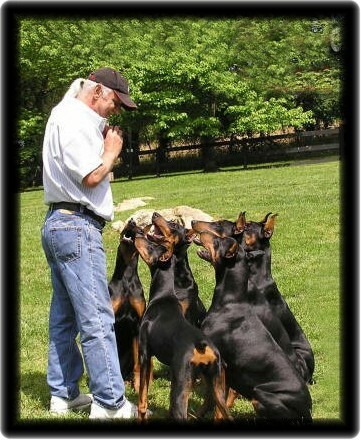 The sixty-five-year-old had his own Hoytt Dobe, a blue female also trained under the Presidents Choice program. So with many of our clients who came to us in the sixties, we are still serving them in fact today, and the reality is that some of these families have more recently seen their grandchildren welcoming Hoytt Dobes into their now adult lives. The Dobes pictured with Mr. Hoytt top photo are simply well educated companions of unsurpassed quality of mind and body who have a complicated family life.